Didn't the MJO get stuck in the western Pacific in late 2009? A strong El Nino in 2018 so soon after the record breaking El Nino in 2015/2016 will be a good indicator that something has indeed changed. I provided the reference to refute the implication of a couple previous posts implying that MJO stalling in the western pacific is reflective of La Nina. Strong MJO activity in western pacific is associated with el nino and not la nina. 2 issues - firstly I'm not sure if you're being disingenuous or not, but there is a significant difference between a stalling MJO and a strong MJO pulse. I don't think either was implied. What was implied was that the stalling MJO would not significantly impact ENSO, which proved correct. Secondly is - I note Chidong Zhang noted in 2001 the significance of a strong MJO pulse upon ENSO SST's, however the lag time noted is roughly 1-2 months. Given the strong MJO pulse of October, where are the resultant impacts upon ENSO SST's? Are we in new ground or does this prove what Long Road Home et al have been saying? I also note that the forecast has it weakening significantly and becoming indiscernible. Surely this would also impact/reduce/remove any forecast WWB's? Stalling MJO pulse means westerly winds in western pacific blowing for longer and a greater warming impact. In general a weaker MJO signal this time around than October would be expected to generate less westerly anomalies, but the link is weak, and we are clearly seeing far more westerlies being generated than in October. No it hasn't. Wait 2 months and see how much warming we get. There is a warm Kelvin wave at about 120W generated by October MJO. Despite the strongest easterly anomalies of the year through much of the central region the last few weeks have seen SSTs through most of the east rise a little. Westerlies are likely to slow down once the MJO weakens, but there is no guaranteed link between MJO and westerlies. Before that happens we will see a lot of westerlies. That's a natural reaction to the MJO passing & stalling in Zone 6/7. 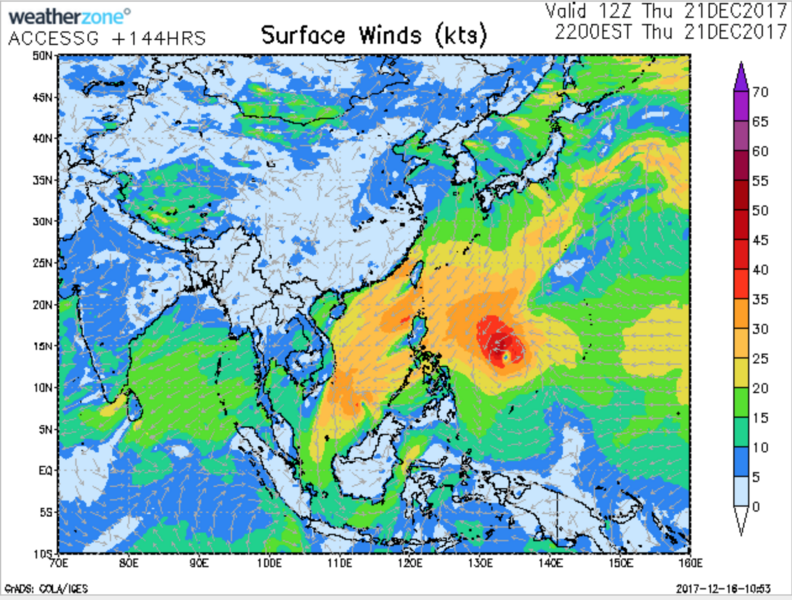 The forecast deep Low / possible Typhoon will take care of any westerlies according to ACCESS and replace them with gale force easterlies that will easily erase any warming by dragging colder anomalies up and across ENSO areas, surely? Missed the edit - but it'll also kill off the MJO as well? models tend to overestimate the warming most of the time nowadays. Early October CFS was forecasting we'd be somewhere about -1.2 by now. November is not over of course, but we are currently sitting somewhere near -0.7 with 10 days to go. March 2015 forecasting nino 3.4 to rise to just over 1.5 by November. It reached 2.9. Absolutely esp since we’re not privy to any inbuilt biases they have. Rubbish in rubbish out. I wonder what is causing the unusual activity in the South China Sea? It's killing our monsoon. Based on what? Remembering a few instances where models have been warmer than predicted, and ignoring other instances where models have been cooler than predicted, because one of those instances was kind of close? The only rubbish is people like you disparaging the hard work of talented scientists based on catchy slogans. Suspect that this burst will have longer term implications - we could be watching the results of this WWB in the months to come. Sure we will see them bounce back once the patterns change but still not ideal...Still warming up off SE Aus which is pretty remarkable. SOI looking like taking a tumble. It's almost if an El Ninolike pattern is setting up in the Pacific, even CFS is starting to toy with the idea of a warm event in autumn next year. Yeah not much in it really, going by those signals it could go either way. 4 registered (avalon, mithrandir, bd bucketingdown, 1 invisible), 53 Guests and 3 Spiders online. Generated in 0.045 seconds in which 0.031 seconds were spent on a total of 14 queries. Zlib compression disabled.